This is 'sidewalk video' astronomy! Meade Electronic Eyepiece (discontinued) - I like that it has manual gain control, very useful at full-moon to dial down the gain/contrast to bring out shadowless features. 0.5x 1.25" Focal Reducer - could work either way with or without, depending on what you want to show. 3M Mpro150 Pocket Projector - long discontinued; 4:3 aspect ratio, 640x480 resolution, about the lowest lumens (15 lumens max) projector out there. On board battery last about 2hrs. While it's rated at ~40" projection, I can get astro vids to show nice on screen size in excess of 100" in dark environments. Can't wait for the moon to wane, and bring out my lowly SDC-435 to give it a go. Yeah, there are several factors involved, including the incongruency of introducing even more light into observational astronomy - but I'm certain there are several situations where this sort of setup can be put into good use, either in an outreach setting or just for the fun of it. Our local club has a monthly outreach event at the local art district, under well-lit locations - I'll be giving it a try then. I also have a 3M M220 65 lumens arriving next week; I didn't know initially if 15 lumens would be too bright, but from the past week of testing it's way more than enough imo - the 65 lumens unit does seem like an over-kill now, but will see how it goes. If you're looking for a pico projector, you might want to avoid 3M units as the analog input cables are propriety and may be hard to find (make sure they come with the unit when buying used). The other option would be aaxa P series projectors that have standard inputs. This one is a picture display from a M42 capture I did sometime back with SDC-435 and 6SE, gives an idea of what to expect. Very cool! Sidewalk astronomy indeed. WOW. A true sidewalk astronomer if ever there was. Now that is just really cool. Something to consider (for all of us)... something I do on Halloween during trick or treat is to have a few telescopes set up. Could you imagine using this setup for that? Maybe I need to start saving up for a video camera. You guys have some really neat stuff that I think would be great for outreach. It doesn't have to be a video camera. It can be a stills or Hybrid camera with video output and do the same thing. Cool idea if I can get a hand on that small-size light-weight projector. It certainly was not limited to video camera at all. One can project the digital image from his/her computer out for real-time public viewing. You just need to look down instead up for observing. Easier on neck. Wow! that is a great idea. Just a suggestion, do you think you could put some sort of white clothing on the sidewalk? It would increase contrast I think. Very cool! Talk about walking on the moon! 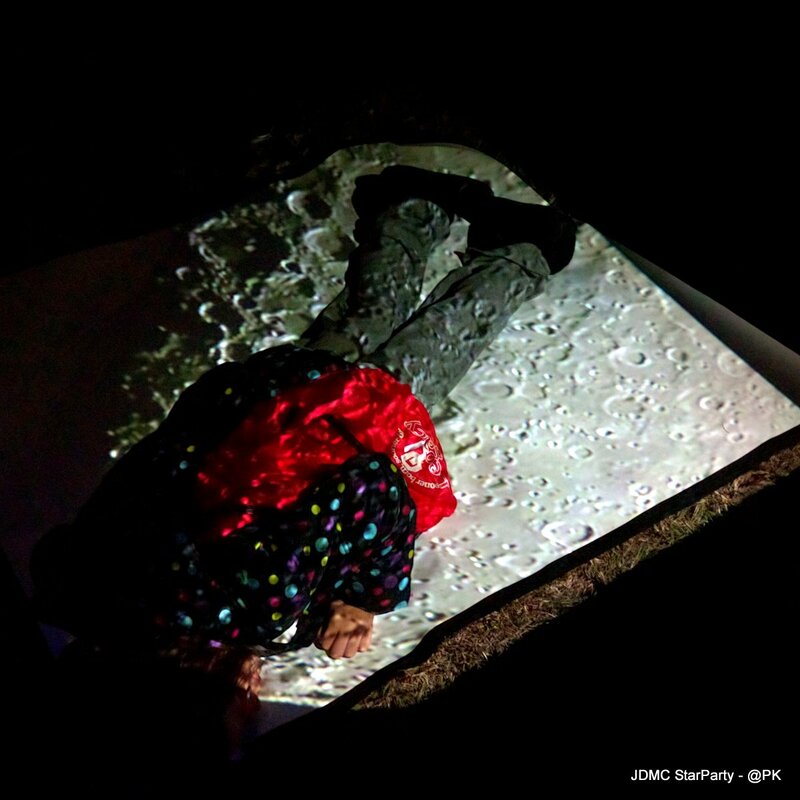 "Giant steps are what you take... walking on the moon... "
Neato! That's a different approach for sure! Thank y'all for the kind words! Definitely not something new (will be planning to use my garage door as a screen for Halloween, thanks scout72!). Dan, I'm going to have to borrow your idea when I get to chance to try this out at a sidewalk/outreach with the moon up - "step right here and walk on the moon!" The Mpro150 seems to be going right under $100 on ebay, still a tad high imo, and the battery (if used) might already be half-way thru its life. The projector is powered via 5V/2A, so if you splice the power cable, it should be pretty easy to use a wide variety of 5V supplies. The AAXA P1 Jr. Pico was $109 MSRP just before being discontinued. Best deal imo for new would be on the look out over at daily deal sites (woot.com, etc) for discontinued or refurbs. Next up I'm going to team the projector up with a analog video processor (in another thread here), which should allow for black-level and other controls, which would hopefully reduce the amount of LP in the video being projected when projecting DSO's (since there's no picture controls on most all projectors). I had a neighbour who used to do Saturday night outdoor movies on the side of his house for the neighbourhood kids. He actually painted part of that that side of the house in a paint designed for projector use. The next step up was a pair of 4x8 sheets of ply with a tight tongue and groove seem between them as a better projection surface. The projector was an older DSP type of unit with 1024 x 768 resolution. Just before I moved I did a few nights of video from the telescope with him. It went over very well with the kids and adults. Large bright objects were the best choices, especially the moon (but M13, 8, 16, and 17 were also big hits). The highlight was "touring" over the surface of the moon at medium magnifications but I had to be careful not to go too fast otherwise I started to get "whow, that's making me sick". The scope was positioned around the corner from the project to help cut down on the light. I stood in between on the corner to be able to talk to the kids and still see what the scope was doing. I found that better surfaces made a real difference with lower brightness projectors. S-video SD 420i resolution was fine for most situations as long as we didn't try to cover 8' sections, but today an HDMI upscaler would probably smooth things out for an even better image. LOL Mark,, that is too funny..
Kasey, It sure was a surprising comment during the moon views. I wouldn't want any of them to , that would be a night to remember for the wrong reasons. I've since had the pico video projector combo working for various outreach events, scouting, and HS astronomy classes. 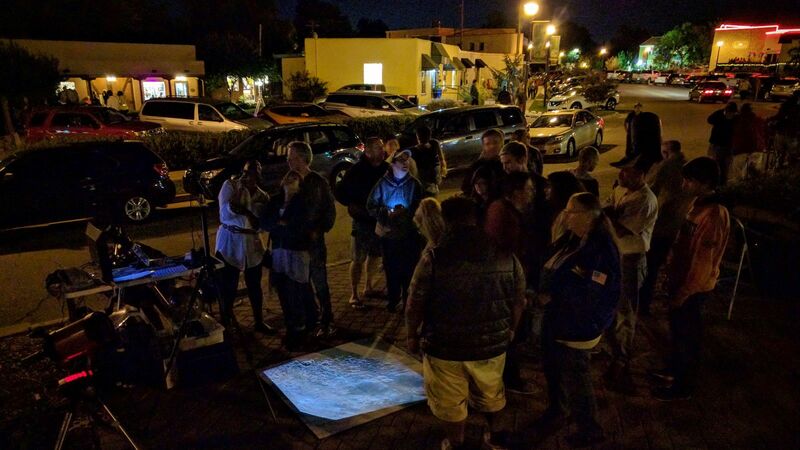 As part of this weekend's 2016 International Observer the Moon night, our local club host a monthly side-walk astronomy at the local arts district. 6SE with 0.63x FR and SDC-435. I used the screen material from an old OHP screens and duck-taped it to the sidewalk. Countless kids, families, adults, and the occasional pets had fun 'walking-on-the-moon', and dancing on it as well (it helped that we had live musicians just behind this pic). A fellow observer had a 4" scope with video on M13 to show on a 26" LCD screen as well. Edited by core, 08 October 2016 - 11:03 PM. That's what it's all about. FUN! Peter, if you read the new rules for the EAA Observing & Equipment forum outreach posts are specifically singled out as acceptable here in rule #1 but they are also highly encouraged. thats awesome.. i recently got a pico-projector, too.. i didn't think about projecting it on the floor.. brilliant idea!! Thanks all for the kind words, much appreciated (I haven't read the EAA Forums rules in a while!). I'd put the 'serious' part of amateur astronomy (astrophoto, tinkering with equipment & hording ) on the the back burner for the past year+, but it's still a joy to share the night skies with others, and I'm fortunate that there are more opportunities than my available time close to my location. Another pic - same setup, this time at a darker location - summer program at a center for children with developmental disabilities - some of the kids on wheelchairs or motorized we having fun driving over the moon, while others just wanted to roll around in it. The perceived resolution of a dinky analog NTSC output is much better than expected, and for the next step I'd like to try a Live View DSLR/mirrorless that can provide live HDMI output, but that would require a portable projector of the same capability. Edited by core, 10 October 2016 - 12:45 AM. Did some research online. The Mpro150 has a bigger brother called the Mpro 180 that has better resolution at 800x600, but both are obsolete. It takes HDMI and A/V composite input. It seems the latest is the AXAA HD Pico Projector with 720P (1280x720) display ability and only $155. Its contrast ratio is twice that of previous versions at 2000:1. Takes inputs of 1080P HDMI and A/V composite. Heck, you could dump your big TV and use this with a laptop and USB TV tuner for a compact entertainment center. Would be great for camping to show a movie on tent wall at 720p. Has one watt audio too. Edited by CharlesC, 14 December 2016 - 07:47 PM. Looks like a nice projector for Outreach astronomy. Edited by dpastern, 15 January 2017 - 06:12 AM.